If you’re like most of the iPad community, you mostly use your iPad for consumption: watching movies, listening to music, playing games, and browsing the web. You engage less often in productive activities on the iPad, mostly because it lacks a physical keyboard. (We’re assuming here that you did not spring for an accessory keyboard for the iPad Pro or other iPads.) As a result, you still schlep a laptop with you on the road even though you also carry the iPad. Parallels, a company best known for letting you run virtualized versions of Microsoft Windows on Macintosh computers, may eliminate the need to carry the extra machine. Its Parallels Access iPad app ties into a subscription service that lets you tap into your home or office PC remotely, whether it’s a Windows PC or a Mac. What sets Parallels Access apart from other apps that provide remote access to computers is that you can get to use all the programs that reside on your PC or Mac, including the proprietary software that your company may employ. Moreover, you can interact with those applications on the tablet as if each were designed for the iPad, and even use a browser running Adobe Flash on the iPad. You start any PC or Mac desktop application on the iPad from a familiar looking launcher screen with icons for the apps you use most often. You can add or remove icons to this launcher screen. Parallels Access lets you run programs on a Mac or PC from the iPad. 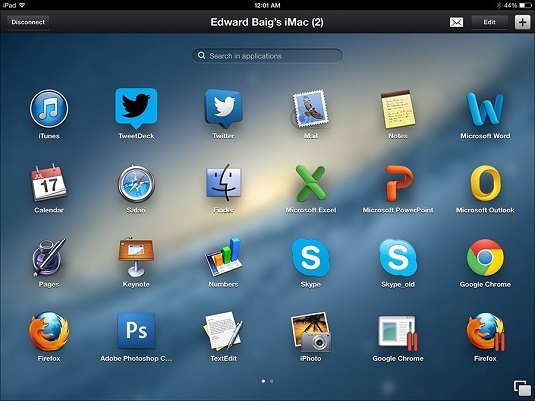 Parallels, as the company puts it, “applifies” PC/Mac programs so that the software is modified on the tablet to display iPad-style buttons for actions such as copy, paste, and select. And touch gestures on the iPad substitute for mouse moves on your computer. For example, tapping is like clicking with a mouse; two-finger tapping is equivalent to a right-click. Hold your finger against the display in an Excel spreadsheet, say, and an iPad magnifying glass appears. You can use your voice to dictate text remotely onto the home or office computer. And you can listen to music on the iPad that resides on your faraway computer, too — no, the folks back home or in the office will not hear what you’re hearing; the app is set up so as not to disturb them. Parallels Access can’t completely make up for the lack of a physical keyboard on the iPad. But the on-screen Mac or Windows keyboards that appear in the app display any dedicated special keys unique to Mac or Windows keyboards. The Parallels Access app is free to download, as is the agent program you must install on each Mac or PC that you choose to access. A single-user Parallels Access subscription is $19.99 per year for an unlimited number of devices (iPads and iPhones running iOS 7 and higher, Android tablets and phones running Android 4 and higher, Kindle Fire, and any device with an HTML5 web browser) and up to five computers (PCs running Windows 7, 8, 8.1, or 10, and Macs running Lion, Mountain Lion, Mavericks, Yosemite, El Capitan, or Sierra).